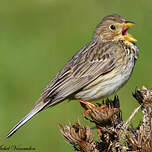 The corn bunting is a rather dull bird, with light underparts and a darker grey-brown back with numerous dark brown longitudinal streaks reminiscent of a skylark. 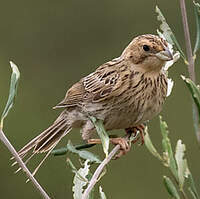 The female bears the same plumage as the male, which is an exception amongst buntings where a strong sexual dimorphism is the norm. 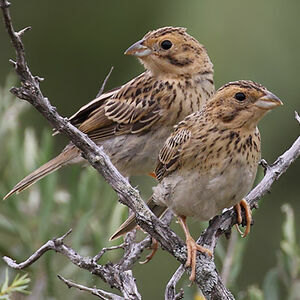 This bird does not have distinctive features, but the absence of white on the rectrices distinguishes it from other buntings. 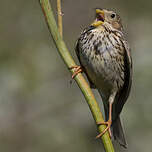 The strong, conical beak is quite remarkable with the edge of the upper mandible curved inwards, and presenting a notch that lodges itself in the lower mandible. The song consists of a series of short metallic clicks, usually in quick bursts 'tsik-tsik-tik' or 'schnirllrl'. 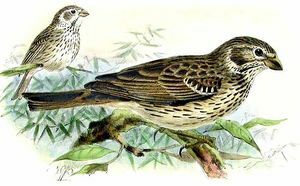 The song is distinctive: a brief scarcely varied phrase with a hacked start and accelerating towards a trill, reminiscent of jangling keys. 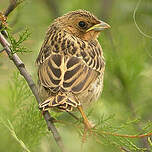 This bird is a lowland species - generally observed at elevations of circa 400 meters. It is mainly found in farmland, particularly in pastures and cereal fields, steppes and grassy slopes, most often in areas with very few trees and shrubs. 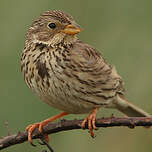 Corn bunting occurs throughout Europe up to the south of Scandinavia, in Northern Africa, the Middle East and south-west Asia. 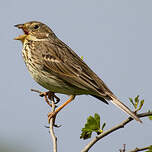 Singing males prefer highly elevated perches but is not fussy and can make do with trees, sparse shrubs, fence posts or telephone lines. 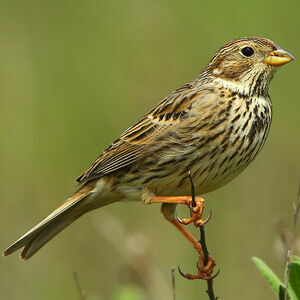 Corn buntings live in loose flocks and are not shy. 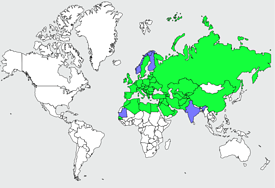 It is mainly sedentary and only individuals found in northern regions form large flocks and migrate to Southern and Central Europe. 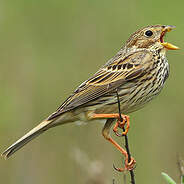 When winter comes, corn buntings can be seen forming large flocks with yellowhammers, the former perching on top of trees and the latter on lower branches. 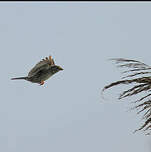 The bird can appear slightly clumsy, wagging its tails whilst moving on the ground. When perched, its legs are clearly forwards. 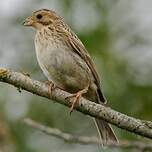 Its diet consists mainly (75%) of seeds, cereals, leaves, grasses and berries, but it can also feed on insects, spiders and small terrestrial molluscs. 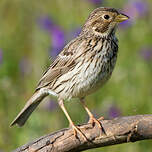 However, chicks are nearly exclusively fed insects and other small invertebrates. Males start singing as early as March and April, while waiting for their female which reaches the nesting ground a little later. 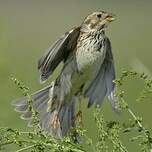 Soon the female starts looking for a small depression in the ground in a pasture, a clover field or a grassy field margin where she will build a nest made of grass and lined with fur. She will lay 4 to 5 eggs that will be incubated for 12 to 14 days. The eggs, of a reddish colour, have quite large brown stains - a common trait to all bunting eggs - and very fine vermiculations. 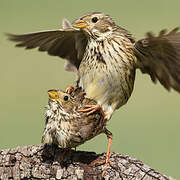 During the first four days following hatching, the female alone feeds its chicks, soon relayed by the male. 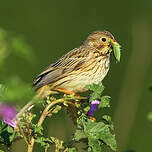 Young corn buntings fledge when they are 9 to 12 days old and still unable to fly, and both parents keep feeding them in the nearby bushes where the fledglings hide. 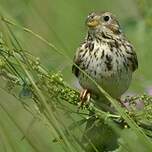 Male corn bunting sometimes exhibit a degree of polygamy, mating regularly with 2 to 3 females, and exceptionally up to 7. 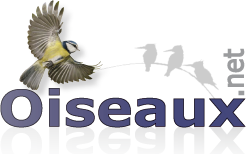 Some pairs have a second clutch, the nesting season lasting until June. 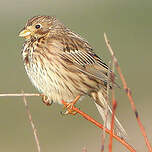 The Corn Bunting is red-listed in the UK and is a UK BAP Priority species.